In Cuba, there are two petroleum provinces, one north and other south. In the Northern Province, the main geological scenario where hydrocarbons are produced is related to a folded and thrusted belt, making it very difficult to identify, by seismic, the elements that make up the petroleum systems (source rocks, reservoirs and seals). The South Province is characterized by tertiary basins deposited on volcanic rocks and ophiolites over thrusted on the North American continental paleomargin. In this province, the seismic is more resolutive than in the north, but there is the difficulty that the rock eval studies have not revealed the source rocks (main and defining element of the petroleum systems) existing in that territory, which are demonstrated by the hydrocarbon shows in wells and on the surface. Although the known oil fields are in the Northern Petroleum Province, there are many oil and gas shows in isolated oil wells, in water wells and on the surface throughout the national territory. The majority of these shows have been studied by the techniques of chromatography coupled to mass spectrometry (biomarkers) and grouped into genetic families that have subsequently been correlated with the source rocks identified in the Northern Petroleum Province through rock eval studies. From the previous data, the geographical limits and stratigraphic extensions of the petroleum systems in the Northern Petroleum Province have been defined. These spatial and temporal characteristics were extrapolated to all that territory and, in this way, the active systems were defined in the different regions of the north of the country. Thus, four stratigraphic intervals of source rocks (Callovian Middle Jurassic, Oxfordian Upper Jurassic, Tithonian Upper Jurassic–Barremian Lower Cretaceous and Aptian Lower Cretaceous–Turonian Upper Cretaceous) and three oil genetic families (I, II and III) were identified. Families I and II were generated by the same level of source rock (Tithonian Upper Jurassic–Barremian Lower Cretaceous) product to facial variations. These variations of facies in the source rocks are something common in the mega basin of the Gulf of Mexico. The source rocks of the Aptian Lower Cretaceous–Turonian Upper Cretaceous generated Family III. In the case of the Southern Province, although there are several hydrocarbon shows that indicate the presence of active source rocks, the lack of knowledge of them does not allow the definition of petroleum systems. 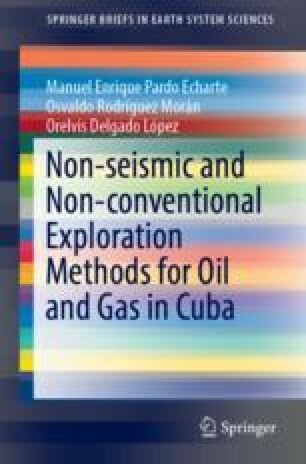 The biomarker data indicate that in the southern basins of Cuba the petroleum systems identified in the Northern Province can coexist (due to the presence of families II and III of Cuban crude oil) with other systems. These are associated with source rocks of the Upper Cretaceous or Tertiary age, according to the presence of Oleanano in oil shows obtained in the Ana María 1 well and in the sands of the keys of the Guacanayabo Gulf.